Read the blog post here. Then please share your feedback around it below. Does this feature exist yet for Visual Studio for Mac? 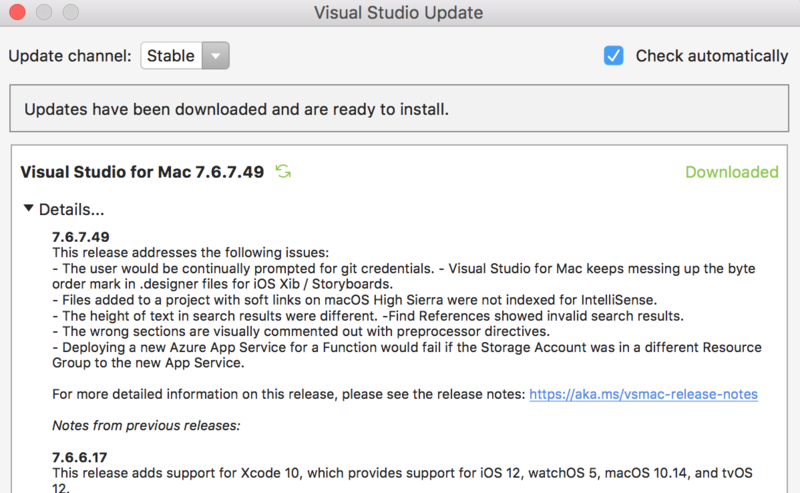 What does "15.8" mean for Visual Studio for Mac developers? Why is Mac not even mentioned in the blog post? Stuff like this happens on nearly every release; documentation features one platform without clarifying if it is applicable to the other one. And the versioning--it's fine if Visual Studio for Mac has its own version numbering, but the release notes need to mention to what Visual Studio for Windows that release corresponds. It seems like all the Microsoft developers know, but they forget to tell us. At the very least this page should have 15.7/15.8 or whatever it is. I can't emphasize this enough: All blogs and documentation should say either "Visual Studio for Mac", "Visual Studio for Windows", or "Visual Studio for both Windows and Mac". Saying just "Visual Studio" doesn't cut it anymore, unless there is a unified major version numbering system and consistent feature parity across both platforms. That's all good feedback; thanks very much for sharing it. Let me see what we can do to address it. As for the split view feature, it isn't available for VS Mac yet. The Mac team is starting to implement it now. We wanted to ship Mac and Windows support at the same time, but ended up deciding to make some architectural changes in VS Mac to support it more cleanly, thus the delay.